The transition from dorm room to apartment is easier than you think. Gone are the days of bed-in-a-bag and egg crates for dorm rooms. The National Retail Federation estimates that United States dorm spending accounts for $50 billion each year. One of my passions and one of our busiest times of the year at After Five Designs has been to turn a cinder block 10×12-foot dorm room into a luxury suite. With some advanced planning and imagination, those same dorm elements can transition into one’s first apartment. It’s common to only think of a single headboard when designing a dorm room, but many times I have used queen headboards in many dorm arrangements and positioned them on the long side of the mattress against the wall as a daybed. Although the cost is slightly higher in the beginning, it becomes a cost savings when the queen headboard is moved into the new space. Purchase an inexpensive mattress frame and mattress at a big-box store and a queen bed is ready to set up in a new apartment with little additional cost. We always dress our single dorm room beds with queen quilts to make sure all the sides of the bed covered as the beds are usually lofted in dorm rooms for extra storage underneath. This same queen quilt, always a washable one, can be used for several years in apartment life. I choose neutral quilts (white or ivory) while, often, shams and foot warmers are in the student’s favorite color. 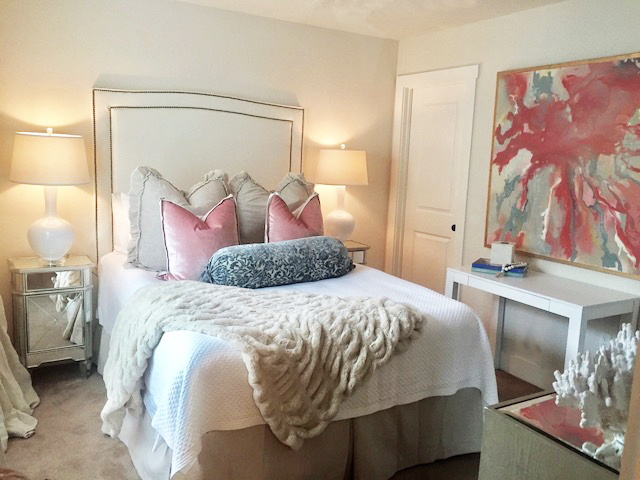 This neutral palette makes transferring to apartment life easy, and if tastes change, substituting or adding color is not an expensive update. About five years ago, I designed a custom cabinet to place between the dorm-room beds that was built to house a small refrigerator. This same custom cabinet works well for storage in a new apartment as a cabinet in the dining room. It’s also beautiful as a console with a mirror hung above it and a lamp and bar accessories on top. It may also be used as a foyer piece housing extra pillows and blankets for weekend guests. In my experience, many colleges have removed closet doors to save space. While the space saving is always appreciated, showing cluttered and crowded closets is not. Our solution has been to design and install a custom closet drape and valance over the closet opening. I have found that this transitions perfectly to an apartment as a beautiful custom shower curtain; just add a shower liner and the set is complete. Saying goodbye to communal bathrooms will be one of the greatest perks of apartment living. Accessories make a dorm room special and they add that same special element to an apartment. Pillows, bulletin boards, framed pictures, and art are naturally at home in both spaces. Mirrors used in dorms can move to the apartment den or bedroom, depending on your roommate’s inventory. You will need kitchen items that were not required in most dorm settings, so shop tag sales and consignment stores for used kitchen pots and pans. Bathroom supplies, dishes, silverware, and cups can all be purchased at discount stores. Reserve your budget for the big items like a decent sofa and a nice window treatment for the living room. If your first apartment is with roommates, don’t fall into the trap of trying to use all of your items. Edit carefully so you can keep your living space clean and beautiful and a happy place to come home to each day. Making the transition from dorm to apartment can be as daunting as it is exciting. Look forward to more space, more independence, learning to cook and clean, and mastering budgeting time and money. By using elements from a dorm room and adding to them, one can easily blend an old life with a new one in style.